Any cancellations or changes within 2 weeks of your arrival date will incur a 100% cancellation fee. Reducing numbers or cancelling before the two week cancellation fee will not incur any fees. There is a $300 per room cash bond to be paid on check-in. This is refunded on inspection of the room after check out. Must book whole dorm rooms. We have a bar on-site so we do not allow BYO alcohol. If you wish to organise any drink specials/packages as well as any tours please email us on groupbookings@nomadsmelbourne.com. 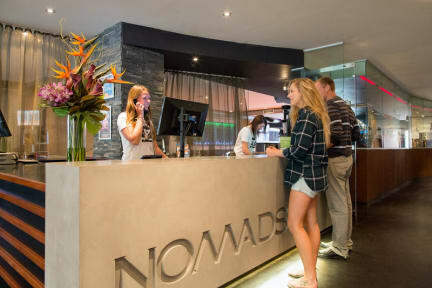 At Nomads Melbourne, you're in the most PERFECT location! We are located directly in front of the famous Queen Victoria Market's and right next to the beautiful Flagstaff Gardens. Oh we forget to mention you're only a stone throw away from Melbourne's iconic nightclubs and sit inside the free city tram zone which means all the awesome high street shops are very easily accessible. Melbourne is literally at your doorstep. Anyway enough about Melbourne, what about inside are really friendly hostel? Well Nomads Melbourne lets you enjoy budget accommodation in style. Your backpacking experience comes complete with our newly opened in-house bar, our feature cinema lounge, our brand new coin less laundry facilities, our quaint guest kitchen (we even provide FREE tea & coffee) and our unbelievable roof top sun deck! Check-in couldn't be easier with our new self-check-in service. Check-in on your phone with the Tipi app or see one of our lovely receptionists at the desk. At our Industry Bar and Lounge, you can relax on the lounges with our diverse range of beers, ciders and spirits at very affordable prices. We host a range of FREE events throughout the week including trivia nights, pool & beer pong competitions, live music and Sunday Sessions. Just ask our lovely staff about what may be happening in the bar during your stay with us. We host FREE Daily activities such as graffiti tours, St Kilda Trips and Botanical garden picnics. You can book travel tours at our MAD travel desk and keep in touch with friends and family with internet terminals, We offer free WiFi in selected areas and selected times. WiFi in your room is also available for a small fee. With our free luggage storage facilities, 24-hour reception and a host of friendly staff, Nomads Melbourne will make your stay in Melbourne a breeze.